Northern lights glow over skywatchers high in the Swedish mountains on Feb. 21, 2014 in this image from the video “Lights Over Lapland” by Chad Blakley. The northern lights dance in a breathtaking display in these stunning images from an aurora video recently sent to Space.com. Night sky photographer Chad Blakley captured these intense auroras grooving over several Swedish Lapland locations, including a small hotel high in the Swedish mountains, on Feb. 21. The result: a spectacular video of Sweden's northern lights display. Brilliant northern lights dance over a small hotel high in the Swedish mountains on Feb. 21, 2014 in this image from the video “Lights Over Lapland” by Chad Blakley. The particles are drawn to Earth's polar regions by the planet's magnetic field. 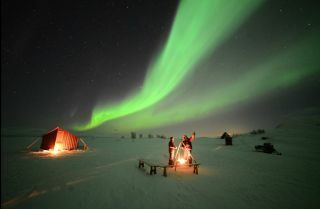 The auroras over the North Pole are known as the aurora borealis, or northern lights. The lights over the South Pole are known as the aurora australis, or southern lights. When the aurora is most active, it creates a spectacular display of bright colors called the aurora corona. "Before we know it, the midnight sun will return and we will have to patiently wait for the auroras to return later this autumn," Blakley said.